It is safe to freeze them. You can either freeze them in the juice or remove the juice and freeze them in an air tight freezer bag. This will all depend on you. Just remember than when you defrost them, they will not be the same as when you froze them. 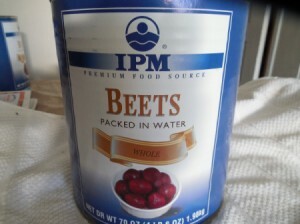 It is safe to freeze canned beets. The texture of canned beets will be softer after freezing and thawing; the thawed beets will be best suited to cooked dishes, such as sauces, soups and casseroles. Here is a link to a site that has excellent instructions for storing beets and an estimated time table to store safely. Beets are a favorite subjects with ThriftyFun members so check out this link for past answers and comments. I think you will find plenty of useful information. You may freeze them. Be sure to squeeze any excess air out of the bags. I would freeze the left-over beets in a plastic container still in the juice, make sure the lid is on tight so as no air can get in the container.